Beleaguered Pontiac has struggled to find an identity in recent years - don’t think we’ve forgotten the Aztek – but there’s a beacon of hope on the horizon, and they’re calling it the 2008 Pontiac G8 GT. Being touted as the savior of this troubled brand, the G8 is Pontiac’s new flagship vehicle, and rightly so. After driving it, we’d have to agree that Pontiac will no doubt have a turn of luck with the debut of this Australian built, V-8 powered rear-wheel drive sedan with horsepower to burn and a 0-60 time of 5.3 seconds. And, yes, it feels that fast. Masking its muscular performance are an upmarket, sophisticated exterior design and a comfortable and stylish interior, all for just under $30,000. The G8 GT is wolf in sheep’s clothing, poised to take on the best Europe has to offer at half the price. 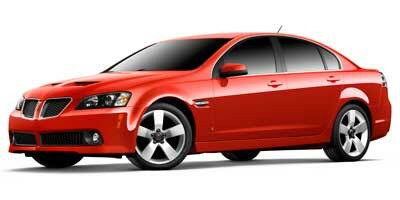 The Pontiac G8 GT is the most powerful passenger car in America under $30,000! Enough said. The large, cartoonish digital gauges displaying oil pressure and battery voltage are located smack dab at the top of the instrument panel and can’t be turned off. Your options are pretty limited; there isn’t an available navigation system, satellite radio or manual gearbox. Gas mileage is, as Mary Poppin’s says, something quite atrocious. See previous “What’s to Likeâ€ section if you’re feeling discouraged. Get ready to do some doughnuts and hear the American, er, Australian, V-8 roar around. Mashing the throttle delivers power almost immediately to the rear wheels via a six-speed automatic transmission and provides addictive, neck snapping, tire squealing, knuckle whitening exhilaration. While the normal drive mode is perfect for city driving, we wouldn’t fault you if you never took the transmission out of sport mode, which provides even more on demand power by altering the shift points to stay in gears longer and use all available engine power. Handling is the only glaring issue with the G8’s drive quality; it’s certainly not up to the Germans’ precise standards. Straight shots and long, loose turns are navigated brilliantly, but tight hairpins can feel a bit unwieldy in this 4,000-pound car. It’s the only time we were reminded that there was room for three behind the driver’s seat. The G8 GT is powered by a 6.0-liter V-8 sequential fuel injection engine, which produces 361 horsepower and 385 lb-ft of torque. The lack of a manual gearbox, an option that is provided on almost all of the competition, will disappoint the most avid driving enthusiasts. However, we were pleased to find that manual mode, controlled by tapping the shifter up and down, is incredibly responsive and will eagerly hold the redline at 6,000 rpm. We’d have loved to see the V-8 push out even more power, but that day will come in late 2008 when the G8 GXP version arrives stateside, boasting 402 horsepower. For more comfort-oriented trimmings beyond the standard air conditioning, power windows and front, side and curtain airbags, the premium package ($2,150) is available with leather seats, heated and power front seats, a leather wrapped shift knob and steering wheel and sunroof. If you don’t need the sun on your head, the $1,850 sport package, combined with the premium package sans the sunroof, adds sport metallic pedals, 19-inch wheels, up from the standard 18-inch, and adds summer performance tires. A standard Blaupunkt audio system reaches your ears through 11-speakers, 230-watts, a sub-woofer and a six-CD/MP3 changer. The system’s equalizer functionality, accessed by a large button on the center stack, really makes a difference in the sound quality. Try listening to the new Britney Spears song on the “popâ€ setting. You know you want to. Lack of high-tech features is where the G8 falls short of its European and Japanese rivals, who have convenient options available like rear park assist. Though, the minimal technology helps the G8 maintain its low sticker price. On the mechanical side, the G8 comes equipped with the Stabilitrak stability system, which allows the driver to maintain control of the sedan through variable road conditions by engaging suspension, steering and braking stability systems when necessary. The power-hungry G8 GT gets 15 mpg in the city and 24 on the highway. This is in line with other gas-gulping V-8s, and much more impressive than the Dodge Charger SRT8, with its 13 mpg city and 18 mpg highway. Thanks to the Pontiac’s long sixth gear, the GT’s fuel economy isn’t too far off from the 6-cylinder, five-gear base model, which gets 17 mpg in the city and 25 on the highway. This LEV-II rated car also has an active fuel management system, found on GM vehicles like the GMC Yukon Hybrid, which operates only half of the cylinders when the engine power isn’t needed, preventing unnecessary fuel consumption. Pontiac, not known for its upscale interiors, has taken a huge step forward with its flagship’s interior. The black, or optional red and black, interior boasts simple lines and brushed metal accents, and the streamlined center stack takes cues from perfectionist German manufacturers. Legroom in the rear is capacious for its class, and the middle rear seat folds down to create a ski pass through to the trunk, big enough to fit three snowboards. The G8 GT’s aggressively designed exterior gives more expensive competitors like the Audi A6 a run for their money. The front fascia still sports the signature split grille, but it looks more modern and classier than some previous Pontiac models. The spoiler has been softened from the large Australian wing to a subtle lip, a decision that adds a sense of maturity to the exterior. The G8 GT skirts just under the $30,000 mark at $29,995, just $2,400 more than the base G8. At this price, the Pontiac will excite previous European brand buyers who want less bells and whistles and more good, old-fashioned V-8 power for about 30K less than what they’d be paying for a car like the BMW 550i. It may also sway former buyers of the Mitsubishi Lancer Evolution or the Dodge Charger SRT8, both of which are priced higher than the G8. The lack of options, like a navigation system, might smart a little at first, but we think you’ll quickly overlook them once you take a spin in this car. The Pontiac G8 GT is a performance car first and passenger car second, so who cares if you’re lost on a twisty back road? The fact that this car can seat five comfortably and has 17.5 cubic feet of cargo room is really just the icing on this deliciously devilish cake.